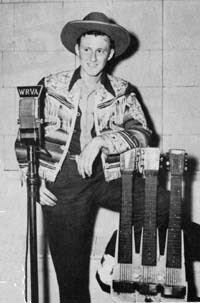 The WSB Barn Dance came into existence in 1940 during the peak of hillbilly music's popularity and revenue draw on the radio. Author Wayne Daniel points out in his book "Pickin' on Peachtree" that radio grew exponentially during the 1940s decade. The number of radio stations grew from 765 to 2,867. By 1940, WSB was a powerhouse 50,000 watt clear channel radio station owned by Cox Enterprises, who wanted to revamp their hillbilly music programming. So, they brought in a consultant, a fellow from Chicago and WLS National Barn Dance fame and later Renfro Valley fame, John Lair. He put in place a revamped lineup of hillbilly music shows and one of them was a Saturday night show called the WSB Barn Dance. 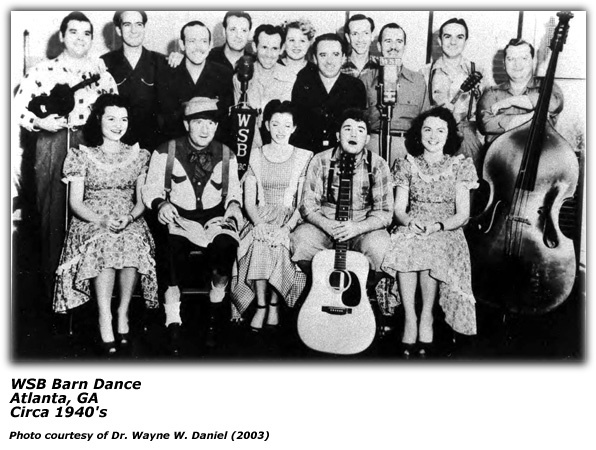 Mr. Daniel writes that WSB Barn Dance achieved such popularity that in the 1941 Hooper ratings, the show was the highest rated of any show on the air in the Atlanta area, network or otherwise. Erlanger Theatre, Atlanta, Georgia, circa 1943Left to right: Harpo Kidwell, Oscar McGooney, Slim Idaho, Little NeHi (WIllie Mae Thomas), Louis Innis, Harold Dunn, Dottie Castleberry, Chick Stripling, James Carson (real name James Roberts), Herman Horsehair Buggfuzz (Ivy Peterson), Martha Carson (nee Irene Amburgey, Mrs. James Roberts), The Sunshine Boys ( Tennessee Smith, Pat Patterson, Smitty Smith, Ace Richman, Eddie Wallace), George Hughes (emcee), Chick Kimball, manager. It seemed to be a proved formula. 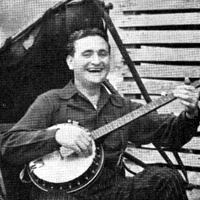 George Biggar wrote, per Mr. Daniel, in a Billboard article that hillbilly music turned the early morning hours of radio from non-revenue to revenue producing air time. Likewise, on Saturday nights, another slow night on radio and known as 'bath night', it became known as Barn Dance and Jamboree night - it changed Saturday night habits. The WSB Barn Dance first aired on November 16, 1940 from the main studios on the top floor of the Biltmore Hotel in Atlanta. The emcee of that first show was probably Dwight Butcher, author Daniel surmises. Audience demand was such that they quickly out grew the studios and on January 4, 1941, the show moved to the Atlanta Women's Club at the corner of Peachtree and 14th Avenue in Atlanta. Still, that wasn't big enough to handle all the crowds that wanted to see the show. They went to doing two shows a night on Saturday nights and would usually broadcast the 10:30pm show over WSB. On May 23, 1942, the show moved to the Erlanger Theatre, located on Peachtree also. 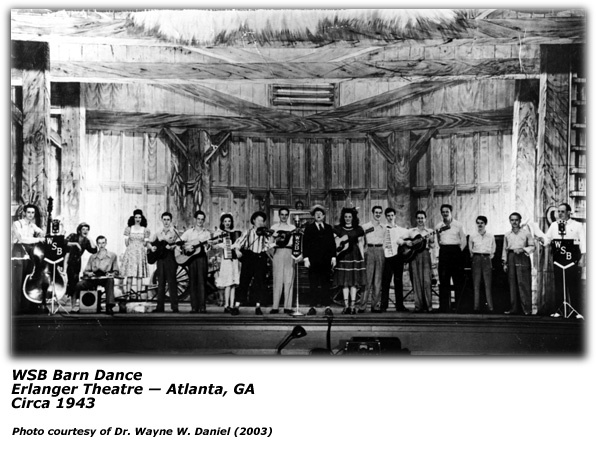 You can read in author Wayne Daniel's chapter on the WSB Barn Dance that the show would play at various other venues over the years throughout Georgia, especially during the summer. We list some of the places that Mr. Daniel noted at the end of this article. "Its about time for us to get off the wind now, but we've had a fine time at your house tonight, and we hope that you'll let us visit with you next Saturday night at the same time, 9:30 P.M., when we'll be broadcasting from the High School Auditorium in Covington, Georgia. The `WSB Barn Dance' is a regular Saturday-night feature of WSB, the Voice of The South, Atlanta, Georgia." 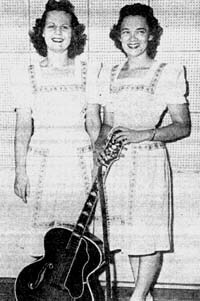 James and Martha Carson, at one time, the "Dixie Sweethearts"
Author Wayne Daniel chronicles in more detail the life of the various cast members and the roles they played in his book, including some of the other directions the careers took for some of these artists. You can find more information about them and other WSB Barn Cast members throughout this site. 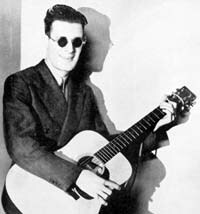 One of the performers was a blind singer and guitar player by the name of Pete Cassell. 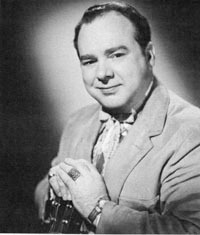 He was also on the WWVA Jamboree out of Wheeling, WV and was known to write a song. 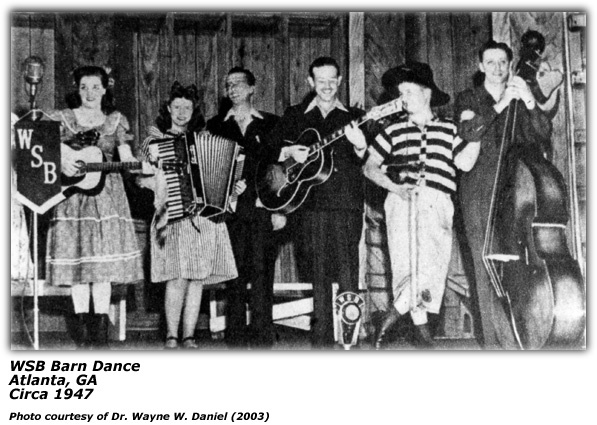 In 1941, he wrote a theme song of sorts that was heard for a while on the WSB Barn Dance. The WSB Barn Dance Will drive your cares away. We always wear a great big smile And never shed a tear. We try to spread some sunshine With songs you like to hear. We'll try to make you happy In good old country style. For you're always welcome To the WSB Barn Dance party." Atlanta, GA, circa 1947Left to right: Mattie O'Neal (nee Opal Amburgey), Martha Carson (nee Irene Amburgey, Mrs. James Roberts), Jane Logan (nee Lily Perry, Mrs. Cotton Carrier), Unknown Swanee River Boy, Billy Carrier (Swanee River Boy), Chick Stripling, Harpo Kidwell. By the end of the 1940s decade, the world was changing. Radio station owners were finding it cheaper to have a disc jockey to play records rather than have live shows. Television was creeping into the world and eating into the ability of the artists to make money from personal appearances as folks stayed home. 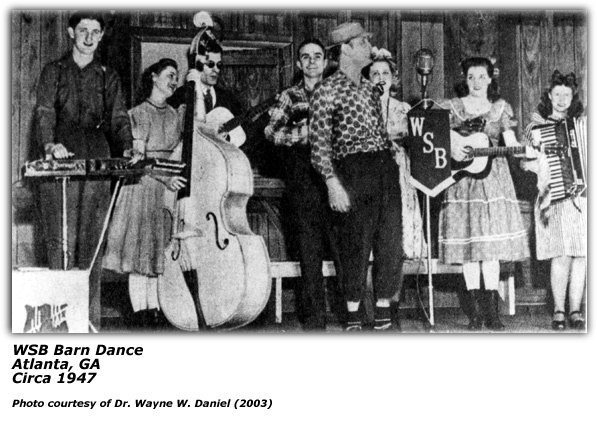 The WSB Barn Dance aired its last show on February 18, 1950. 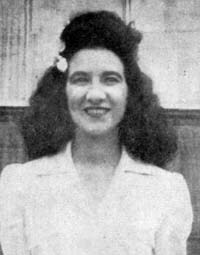 Photos and identification of artists in photos provided courtesy of author Wayne W. Daniel. Program Listings courtesy of Wayne W. Daniel; different listing each time page is viewed.